ALTINUS (ATTINUS), a first century missionary bishop who is credited with founding the churches of Orleans and Chartres. There is a tradition in which he is said to have flourished in the fourth century and was a martyr. AQUILINUS, a Frankish nobleman who after fighting the Visigoths under King Clovis II, returned home and he and his wife agreed to separate and dedicate their lives and wealth to caring for the sick and the poor. St. Aquilinus was consecrated Bishop of Evreux in 670, though he led more of a hermetical life than that of most bishops. He reposed in 695. DESIDERIUS, a monk and disciple of St. Sigiranus (5th December), he spent the later years of his life as a hermit in La Brenne near Bourges until his repose circa 705. EDNOTH (EADNOT), a monk at Worcester Abbey and later Abbot of Ramsey Abbey in England. He was consecrated Bishop of Dorchester in 1006, with his seat at Dorchester Abbey in Dorchester-on-Thames in Oxfordshire. In 1016 St. Ednoth was martyred by the Danes. ETHBIN, born in Britain to a noble family, and educated in Brittany by St. Samson (28th July) Bishop of Dol. Following his ordination to the Diaconate in 554 by St. Sampson, St. Ethbin entered Taurac Abbey where he remained until its sack by the Franks in 556. He then went to Ireland where he spent the rest of his life as a hermit in a forest near Kildare. St. Ethbin reposed circa 625. EUSTERIUS, (Fifth Century), the fourth Bishop of Salerno. No further details are extant. FRIDESWIDE, the patron saint of the city and University of Oxford. We are entirely dependent on a brief account by William of Malmesbury, and two twelfth century Lives for any information on her life. 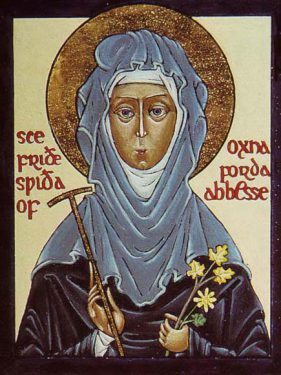 According to these, St. Frideswide was the daughter of Didanus, ‘King of Oxford’, and following the death of her mother, while St. Frideswide was still a child, she received monastic tonsure and entered the double monastery of St. Mary the Virgin which had been founded by her father, serving as its first Abbess. The Lives also report she was miraculously transported to Bampton Oxfordshire, where she hid for three years, to escape the amorous attentions of Algar of Leciester. During this time, Algar is said to have tried to storm Oxford, it is assumed to take St. Frideswide, but was struck dead at the town gates. St. Frideswide then returned to Oxford, and continued to serve as Abbess until her repose in either 727 or 735. St. Frideswide is also believed to have spent some time at Binsey, near Oxford, where a holy well appeared in answer to her prayers. At some point following her repose her monastery came to be called after her, and there was a shrine containing her relics. The monastery was destroyed in 1002 during the St. Brice's Day massacre. Subsequent monastic houses at the site maintained a shrine for her relics though during the Reformation, the Dissolution of the Monasteries, and after her shrine was repeatedly vandalised and the ultimate disposition of her relics is debated. The present-day Cathedral Church of Christ which is both the chapel of the Oxford college Christ Church, as well as the cathedral of the Church of England diocese of Oxford is located on the site of St. Frideswide’s monastery. Though her feast was abolished during the Reformation, it remained on the Oxford University Calendar, and a service attended by University and civic dignitaries is held on, or near 19th October. for the Lord hath truly made her wondrous among His saints. By her supplications may He save our souls. 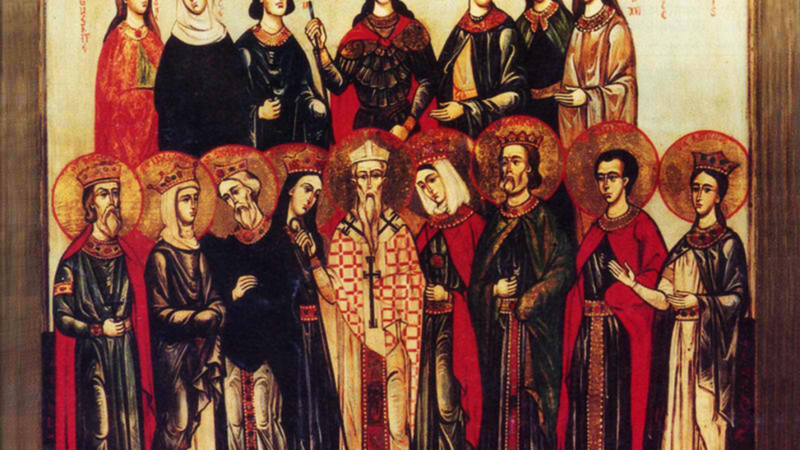 LAURA, born in Cordoba, she became a nun at Cuteclara following the death of her husband, eventually becoming Abbess. One of the Martyrs of Cordoba, St. Laura was thrown into a cauldron of molten lead by the Moors in 864. LUPUS of SOISSONS, a nephew of St. Remigius of Rheims (1st October), St. Lupus served as thirteenth Bishop of Soissons from 505 until his repose circa 540. PTOLEMY and LUCIUS, martyred circa 165 in Rome under Antoninus Pius. Ptolemy was put to death for baptising a woman. Lucius and an unnamed man protested the sentence, declared Christians, and were also martyred. Their martyrdom was recorded by St. Justin the Philosopher (1st June). THEOFRID (THEOFROY, CHAIFRE), a monk and later abbot of Calmeliac, near Le Puy in present-day France. St. Theofrid was beaten to death by invading Moors in 728. VERANUS, a Bishop of Cavaillon who reposed in 590. He is remembered for his charitable works and patronage of monasteries in his See. St. Gregory of Tours (17th November) related several miracles performed by St. Veranus, including driving out a dragon.